‘This excellent Apple has long been cultivated in the Royal Gardens at Kew, where it is considered to rank amongst the best of those varieties which are capable of being preserved for the dessert through the winter months. The tree is healthy and vigorous, seldom failing to produce fruit in abundance. The blossom is small, like that of the Nonpareil, fruit small, oval, flattened at both extremities, resembling in form the old Golden Pippin, but larger. The eye is well formed, open, and sunk in a broad but shallow cavity. The stalk generally short, slender, and tough. Skin green, rather approaching to brownish yellow when well exposed, with a large portion of russet brown, particularly round the eye. The fruit is always produced in clusters at the end of the branches, often eight or ten together. The flesh is of a greenish colour, breaking, tender, well flavoured, juicy, and sweet, when ripe, which is not earlier than in January, and it is in great perfection until March, or even later.’ [PL pl.42/1818]. ‘A very excellent dessert apple of first-rate quality; it is in use from December to February. The fruit is produced in clusters of sometimes eight and ten, at the ends of the branches. The tree is of small size and slender growth, and not a free bearer. It is well adapted for dwarf and espalier training when grafted on the doucin or paradise stock, in which case it also bears better than on the crab stock. According to Mr. Lindley this variety was grown for many years in the old kitchen garden at Kew; and Rogers thinks it first originated in the Turnham Green nursery, which was during a portion of the last century, occupied by a person of the name of Robinson.’ [Hogg p.172/1851]. Probably the apple figured as Robertson’s Pippin in the Pomona Britannica. [PB pl.XCI/1812]. 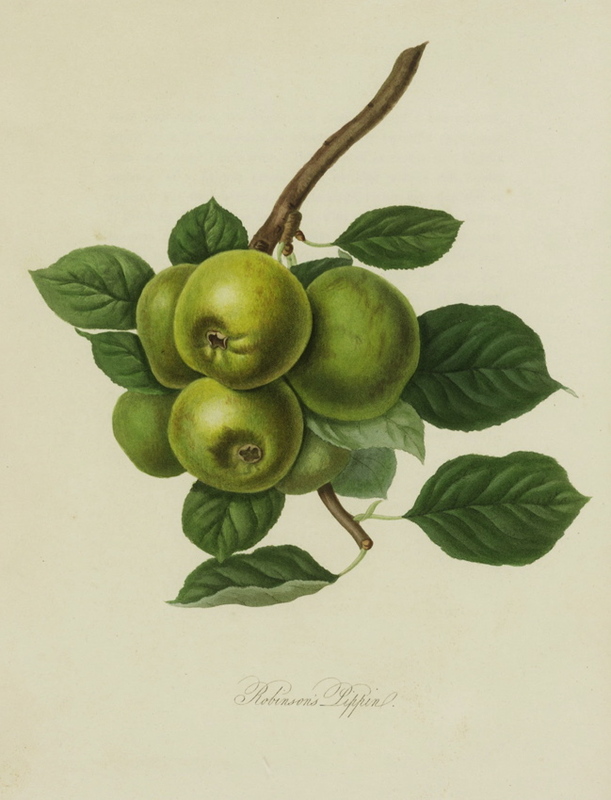 Listed as ‘Robinson’s Pippin, apple no.71’ in a hand written list of apples in an 1850 catalogue held at Camden Park [CPA]. Most of the plants hand-written in this catalogue subsequently appeared in the 1857 catalogue. That the apples did not is probably an oversight.